This is actually Anthony Logistics’ top seller at Sephora for ten years running. It’s deliciously creamy, non-greasy, soothing, and very cleansing. Most readers and many followers on Twitter will know that I’m very pro-foaming face washe and very anti-cleansing oil/balm etc. I like the feeling of being clean, so I was naturally a little sceptical of the Anthony Logistics Glycolic Facial Cleanser. What can I say? It really leaves you feeling soft and very clean, but not tight and dry. My worry with anything creamy is that your face can sometimes feel a little sweaty afterwards, particularly if you aren’t inclined to use a toner to remove the remaining traces of cleanser. On first use, I wanted to see what it felt like without using a toner afterwards and I was hugely surprised. It’s formulated without parabens, sulfates, synthetic fragrances, synthetic dyes, petrochemicals, phthalates, GMOs and triclosan. What’s Glycolic anyhow? Well Glycolic Acid is a chemical exfoliator that loosens the bonds of surface dead skin cells, allowing them to be easily swept away. There’s a fairly decent concentration of Glycolic Acid – 4.9%. Because all chemical exfoliants can risk leaving your skin a teensy bit dry, soothing and moisturising Aloe Vera helps to calm the skin and help to bond water to the freshly exposed skin cells. Finally vitamins C and A, two very powerful antioxidants, help to protect and smooth the skin. Vitamin A helps to protect and help rejuvenate our skin’s natural support structure whilst Vitamin C is a fantastic brightening agent. There’s no artificial fragrance but the natural Pomelo and Mandarin peel extracts give the Anthony Logistics Glycolic Facial Cleanser a really gorgeous citrus scent that lifts you as you get to work with it. 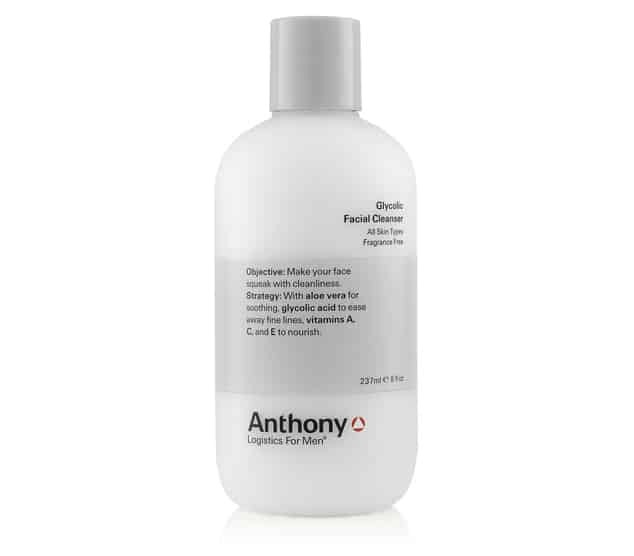 Anthony Logistics Glycolic Facial Cleanser is £21 for a great big bottle (237ml) and available here from Mankind. Check it out. This article first appeared on MANFACE written by Thom Watson. It was published on Friday 26th July 2013 and was last updated on Monday 3rd April 2017 at 3:33pm. It's categorised under Acne, spots & blemishes, Anthony Logistics, Anti-Ageing, Cleanse, Combination Skin, Dry / Dehydrated Skin, Makeup, Oily Skin, Sensitive Skin where you'll find more related content. Great review Thom! I recently tried their Algae Facial Cleanser and really liked it. This cleanser sounds really nice! So glad to hear it has other fans out there! It’s definitely swaying me over to gentle, cream-cleansers.